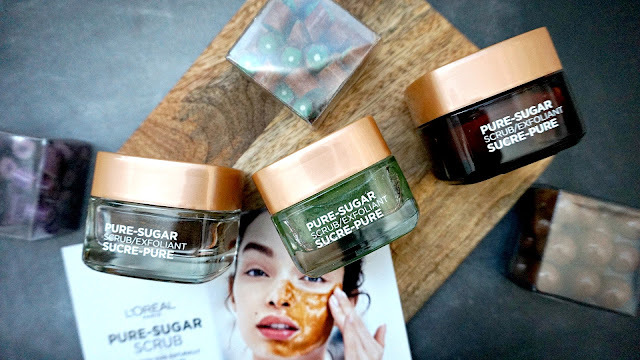 L'Oreal recently launched three new face scrubs to their skincare collection and I could not be more excited to try these. I am a big fan of exfoliating so being able to try new and innovative proucts as they come to the market, is a great opportunity. These scrubs retail for $14.99 cad each and can be purchased at your local drugstores. They are formulated with a blend of white, blonde and brown sugars as well as other ingredients, depending on which one you're using. I have been a fan of the L'oreal Skincare products as I've tried them out, if you're interested in reading about my past posts - please click here. 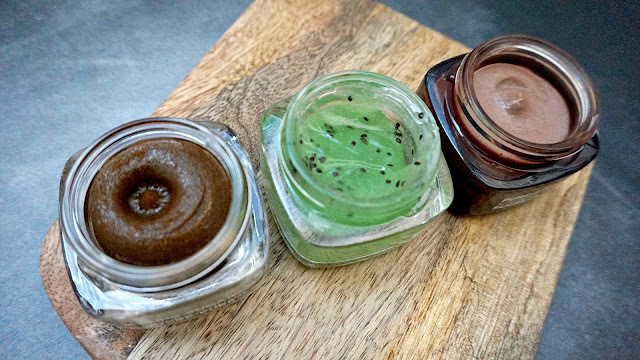 This mask is made with finely ground acai that gives it the gritty texture, in conjunction with the sugars. It also contains grapeseed and monoi oil for hydration. If you love the feeling of a good scrub that isn;'t too abrasive, then this is for you - I appreciate a good gritty scrub as it truly feels like I am helping rid my skin of any dead skin cells or junk. This has a scent and feel reminiscent of brown sugar. This is my favorite one of the trio of scrubs. It smells like white grape juice and contains kiwi seeds. It is more of a gel-like consistency and does not really have that gritty exfoliating sensation. This one I used more like a face mask and it made my skin feel very hydrated and cooling. Keep this in the fridge and it would be perfect to use in the summer time! Lastly, we have one that is most like chocolate frosting in a bottle. It contains finely crushed cupuacu seeds to give it the exfoliating texture. However, as mentioned and as you can see it is a very creamy consistency so it hydrates and softens the skin while working simultaneously to exfoliate it. This is great for those with dry skin or have those concerns from the colder weather.